The Leaf or the Volt: Which is Better? The following is a post from Felix Kramer at CalCars, one of the original and most visible advocates of plug-in and electric cars. (Felix has driven Al Gore and several movie stars around in his plug-in Prius. 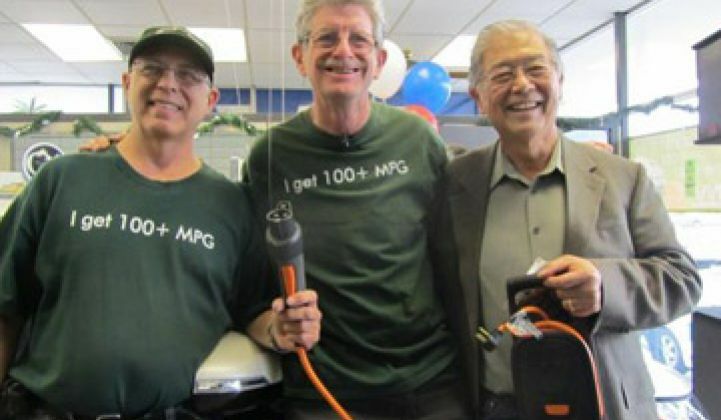 He's in the center of the photo flanked by Ron Gremban, the tech lead at CalCars, and Andy Frank, the father of the plug-in hybrid..) A few weeks ago, the Kramer family became the first to own both a Chevy Volt and Nissan Leaf. They like both cars, but the extended range on the Volt comes in handy: the Kramers have already taken it to Tahoe and back twice. Since we got our Volt on December 22 and our Leaf January 24, I've felt like we've taken a time machine to the future. Since as the Founder of CalCars.org I've been doing little else but talk and evangelize about this for a decade, I thought I'd be ready for this moment. But now that it's really here, it's far better than I ever imagined! Each car is like a 21st century space capsule, gliding silently through streets clogged with last-century vehicles. I was never so aware of the unique and ugly sounds from each gas-guzzler. At stoplights, I even feel their low-frequency vibrations. As a driver of a Prius since 2004, which 60,000 miles ago in 2006 was converted to a plug-in hybrid, and as an occasional driver of a RAV4 EV or a Tesla Roadster, I've had glimpses of how this feels. But it's completely different to drive this way almost all the time! Each car greets the driver with fun as its first feature. The instant torque of electric motors turns each of them into rocket ships at low speeds, and easy lane-changers on the highway. The driver's seat of the Volt feels like an airplane cockpit. It's a little intimidating at first, but reassuring after a few minutes of studying the controls and displays -- or just ignoring some for a while. The Leaf has a spare quality, and the simpler right-side panel is all about audio and climate. Each car offers subtle clues about its fundamental character. The Volt puts a whole car between the front left electric door and the rear right gasoline door. Inside, the button to flip open the electric door stands out while I have to work to reach the gas-door release, giving the message, "You're not going to be using this very often." The Leaf's charging ports are under a giant door right in the center of the car's nose: "There's nothing going on in here but electricity." Each car's manual is full of important information -- far more than I got even in the superb orientations from Novato Chevy's Terry McCarter and North Bay Nissan's Victor Maldonado. But each is daunting, and, unsurprisingly, written defensively and sometimes in legalese. I downloaded them from http://www.chevrolet.com/­assets/­pdf/­owners/­manuals/­2011/­2011_chevrolet_volt_owners.pdf and http://www.nissan-techinfo.com/­refgh0v/­og/­Leaf/­2011-Nissan-Leaf.pdf . Alas, for a spare copy, pages designed to fit in a glove compartment don't print well on letter-sized paper. And while the Volt's Index listings are live links, the Leaf's aren't, though once I got inside its chapters I could click to navigate. Nissan and GM may be watching Hyundai, which turned its Equus manual into a downloadable app -- and included an IPad with the car. Rochelle's first comment was, "Hey, I love these cars!" (She and our son Josh, both shown at the CalCars.org "Plug-Ins Arrive" page, have been stalwart supporters.) She wishes both carmakers had personalized the mirrors so she doesn't have to reset them every time she gets in after I've driven it. Otherwise, she's happy to just be able to get into each vehicle, push the 'on' button and drive it like any other car. She says it was a bigger adjustment to switch from a 1997 Camry to a 2007 Camry Hybrid than from that car to the Volt. She appreciates the rear cameras, especially important now that most safety-conscious cars come with thick side pillars. The Hard Numbers. Our Leaf experience began with a fair test with an EPA-assigned 73-mile range: from the dealer in Petaluma to Redwood City. Driving at 65 MPH the whole way and not bothering to detour around the steep hill in San Francisco between the Golden Gate Bridge and US 101 (which cost about 4 miles of range), we finished a 74-mile trip comfortably with 14 miles to spare. The Leaf is reassuringly predictable: with 80-100 miles of juice, most of the time, we don't think about range; we just drive around and charge it at night. With 163 miles in four days, it may become our first-to-use car, with the Volt reserved for times we both drive and for distances. We started each of the four drives with a full battery (boosting our average), then had major uphill drives (reducing MPG). The combined 43.2 MPG is about what a second- or third-generation Prius gets on that route. (We expect the Gen2 Volt will improve its long-distance "charge-depleted" driving performance, which wasn't the top priority in GM's four-year push to meet the Volt's promised delivery date.) This proves a PHEV's best selling point: this one car can drive all-electric most of the time at its base location, then go any distance worry-free with good fuel economy, and again drive entirely electrically at its destination. We've reached a sweet moment. Since 2005, CalCars has been trumpeting that plug-in hybrids (and extended range electric vehicles) get 100+ MPG of gasoline (plus a penny a mile of electricity). GM didn't squawk when the Volt sticker said its MPG when using gasoline and electricity would range from 69-168 MPG for 30-75 mile trips. Now our real-world Volt experience confirms both our experience with conversions and our predictions for production vehicles. Many of our Bay Area trips in the Volt have exceeded the car's typical 35-40 mile all-electric range -- and we've used our portable charging connector at a destination only once. When we subtract out the two long trips, our local 1,346.9 miles on 11.8 gallons were at 114.1 MPG. (And CalCars colleague Ron Gremban driving his Volt Lynne McAllister showed 205 MPG after their first 468 miles, mostly in Marin County.) As they say, QED -- point proven! Stay tuned for more specifics and comparisons in the future.